Well’s home garden, about half an hour north east of Melbourne. I was lucky enough to visit at the end of last year, just as spring was becoming summer. Steven had shown me pictures of his garden before, but nothing had quite prepared me for what I about to experience. It absolutely had it all. It was one of those gardens that occasionally comes along and makes you feel about five years old. You just want to throw down your bag and run around the place, to explore each and every corner. And boy, are there a lot of corners (we’ll come to that later). This garden gets eleven out of ten for all three criteria of ‘bold, fit and character‘. But it has so much more. I’ll lay out the four aspects that wowed me most. Thinking about it now, I’m pretty sure you’d never be much more than eight metres from the house, wherever you stood in this garden, with all but one side not much more than path-width. And yet with two distinct dining areas, a separate fire pit and numerous additional seating areas in thoughtful locations, this garden feels huge. As you stroll out from the house, clever glimpses reveal hidden areas tucked away and intrigue you to explore. Along the way, you see unexpected treasures which stop you in your tracks and even the fifth time along that same track, you are still spotting things for the first time. There is such depth to this garden, such imagination, that you feel it would take weeks to see it all. And yet it can’t be more than 150 square metres. Steven has used a whole range of techniques to divide up the garden into smaller areas, keeping just enough sight lines to make it feel open, spacious and interesting without revealing everything at once. He has then used layering to work every single square centimetre, resulting in a fascinating, beautiful, yet uncluttered look. It really is remarkable. And if you thought the challenge of space was quite something, have a look at these angles and slopes. There are all sorts of acute angles and nothing much lines up with the house itself. It is nothing short of mastery that Steven has displayed in producing a garden that feels both entirely boundary-less and in total symbiosis with the house. Easily to look at it now and think the layout is obvious, but seeing the before photos gives some idea of just how much vision Steven had. Today, there are thousands, if not millions, of experts in creating unity and cohesion in a design. However, for the most part, each expert takes an element or two and repeats it lots of times. A beautiful pot with a beautiful shrub, times by five and stick in a row. Job done. To create unity and cohesion without instant boredom is another skill altogether and the more complex the design, the harder it is to achieve. So given the complexity – in detail, in layout, in the variety of material – that Steven has chosen, it is, quite literally, a miracle that the whole thing comes completely together. To have unity that challenges you – the cohesion is clear but you’re not sure why or how – is the ultimate design skill. Steven pretty much made everything in the garden from scratch himself, upcycling the most unusual objects (cement mixers, children’s slides, you name it) and this theme of rustic objects is just one aspect that aids unity. But Steven’s eye is one in a million: the colours are amazing, the textures, the forms, just nothing looks out of place. I’ve always loved the idea of someone’s personality being reflected in their house or garden, but it’s something I’ve only really understood and fully believed in for the last few years. If you don’t have a lawn to walk on, have a pair of lawn thongs by the back door instead! If I was to describe Steven to someone who hadn’t met him, I would say he was sparky, energetic, fun, modest, quirky (I caught him rolling down the bank of an open garden the first day I met him!) generous, cheery, upbeat, adaptable, bright and spirited. I’ll challenge you to not find any of those characteristics in his garden! We’ve had some good debates in the comments section of this blog around ‘soul’ in a garden. It’s something that’s really tricky to put your finger on and articulate, but that is crystal clear when you feel it. It’s also the one thing many would say is the primary success factor in a garden. And this one feels so right, not only because it is stunning to look at, but because it is Steven inside out. I’m feeling exceptionally lucky right now. My big news is that I have finally moved into a beautiful new home in London, with a reasonably-sized, if currently rather bare, terrace. The second stroke of luck is that Steven is coming to stay with us very soon. The third is that Steven is not only one of the cleverest gardeners I know, but also a very generous one. And so I’m very much hoping to bounce some ideas around with him, glass of wine in hand. Can’t wait to see you, Steven! OK I’m going to give up gardening now…..after seeing this one which is so charming and perfect what could I possibly do to achieve a similar beauty and rhythm? Truly I can’t give up the garden but I would love to have Steven’s talent. Don’t give up!! I do know exactly what you mean though. Whenever I visit an outstanding garden I always have a mix of emotions. In part I feel elated and uplifted by its beauty and in part I feel overwhelmed and a little sad that my own gardens never quite seem to get to this stage. But I can definitely say that the elation wins hands down over the sadness and the optimism, energy and list of ideas I take away from each brings me such joy. Even Steven’s garden is constantly changing – never finished – so I think we just have to celebrate and enjoy the incremental progress we make and not be too harsh on ourselves. You never know, you may have Steven’s level of talent just bursting to come out of you, given half the chance! Happy gardening! If I could see a garden like this just once a year, I would be happy. ‘Soul’ is so important (to me) in a garden and gardens that truly have it seem to be so few and far between. A garden must reflect the owner wholely and solely (no pun intended) and Steven’s garden does that. Like you Janna, when I visit a ‘great’ garden (and they don’t have to be large to be great), I always come away inspired rather than downhearted. Your comment of ‘A beautiful pot with a beautiful shrub, times by five and stick in a row. Job done’. Yes that seems to be the way of many (even big name) designers. You can feel the ‘soul’ pouring out of Steven’s photos, it must be quite an experience in real life – and sadly I rarely find that in gardens I visit. Good on you Steven! And thanks Janna. 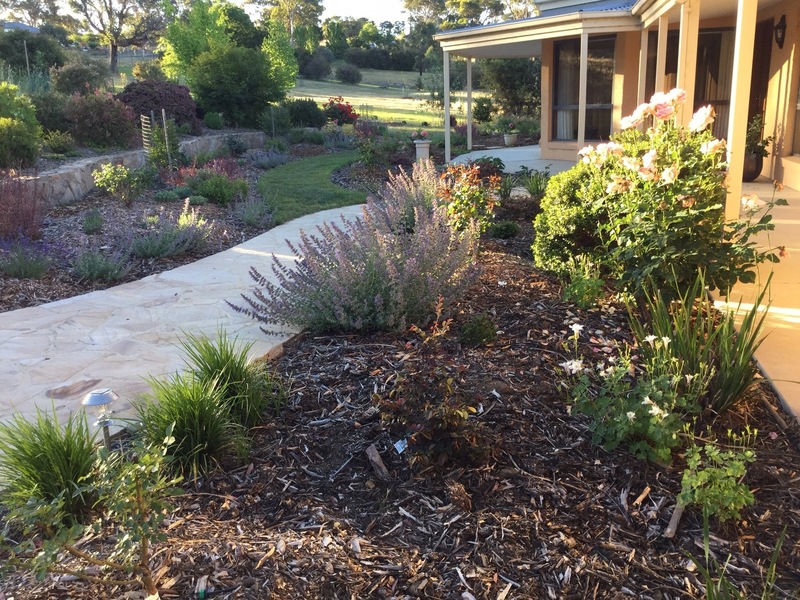 Steven’s garden epitomises everything we value in a garden, doesn’t it? It offers up so much; way beyond purely aesthetic benefits. But then Steven is a professional (and international speaker on) horticultural therapy, so it’s no surprise he has the skill to create a garden with soul. It is so exciting that his line of work is gaining so much traction. And it has given me hope for come the day I downsize from my acre to a smaller patch – in fact as long as the neighbours are good, I can’t wait to try it especially now I have seen Steven’s garden. In the mean time I will plod on here. Steven has so clearly shown that no challenge is insurmountable. I feel just the same way about my new, very much reduced, garden! In many ways it is more exciting. A fabulous and inspiring garden. And wonderful news about your new home, Janna! Thank you Deirdre. It’s just wonderful to feel settled again. I think we’re going to be very happy here. Just lucky to have Steven’s inspirational garden to help me think through my next bit of planting! I’m so glad you have done a post on Steven’s garden. 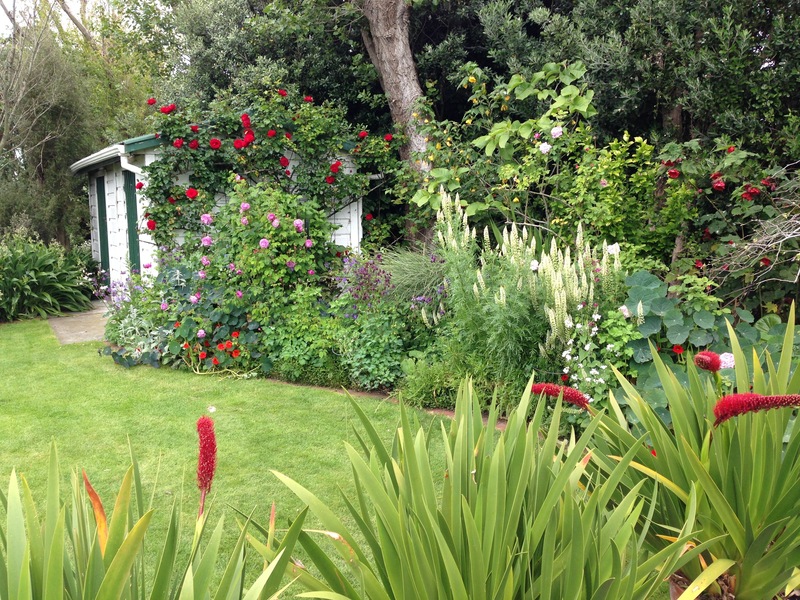 I have been lusting over images of his garden for some time and you show some lovely new angles and updates. I have a lot of the same raw materials but not the vision or talent to create these amazing scenes. Mine just look messy. Steven’s is SO beautiful and quirky. I love it. Congratulations on finding a new home. I hope we are kept up to date in your posts. Steven’s IS so beautiful and quirky and so is yours. Messy is absolutely not a word that comes to mind. You are right, they are similar in so many ways, both with huge soul and great history and stories behind them. Both reflecting you as individuals and your local surroundings. Both modest in the most endearing (and wonderfully nonmaterialistic) way. I would say there is only one real difference and that is in the scale of your gardens. You have just as many treasures (quite literally!) but they are spread out over a much, much larger area, so the layering is not so apparent. You are also gardening in a desert (and a big desert, at that), which makes it much more challenging to keep the ‘full’ effect going. Never underestimate your talent, Suzanne; it is extremely rare to come across someone with an eye as sharp as yours. Oh, and I’m inviting myself back at some point, by the way. I’m going to take time to take wonderful shots of your garden (instead of rabbiting on!) and then show you in a post just how magical your piece of paradise is! Oh Janna, I’m quite overcome by your comments and would love for you to revisit. As you know I do love my garden but the few people other than family whom I have shown around are rarely positive. One lovely lady (and yes I do like her) said in the sincerest and nicest way…”Sue have you ever thought you should just pull it all out and start over again”! I am still working on filling the spaces. The little tube stock is growing nicely and I am constantly adding more and of course I also propagate. Thank you for your support and encouragement. I’m sure you’ll have great fun filling the spaces on your new terrace. Right, it’s a date. I can’t make it next week, but I promise I will get there. And in the meantime, find some people with vision to invite over! The comment from your lovely friend reflects only on her, not you. Everything you have done to date is perfect; the only thing that could possibly enhance it further is to just keep tackling your own challenges (primarily drought and hours in the week) and do more of the same. As those new plants grow and fill spaces the dots will all be connected up and I am quite sure even you will have to agree that any existing ‘messy’ thoughts have vanished! The ‘before’ picture looks horribly familiar.. and that is inspiration in itself! What a transformation. You are not short of slopes at your place, are you?! They are wonderful assets in theory, but every time you fall down one you must dream of bowling greens! A transformation, indeed. It is the model garden showing us what can be done if plenty of thought is put into it. I am sure you are right that difficult plots prompt much more ingenious solutions. We can’t just apply a stock formula. So glad you are meeting up with Lisa; I think you will have lots in common!